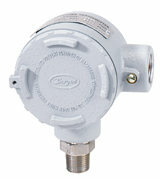 Series 634ES Transmitters sense a single pressure for air, compatible gas or liquid and provide 4-20 mA output signal. Positive pressure can be measured within an accuracy of ±0.5% of span. The Series 634ES uses an isolated piezoresistive pressure sensor to produce a resistance change across a wheatstone bridge. Convenient 2-wire operation simplifies installation. Zero and span adjustments are fully protected inside a rugged die cast aluminum housing with durable gray polyurethane finish. Enclosure is designed to meet NEMA 4X requirements. Service: Compatible, gases & liquids. Wetted Materials: Types 316, 316L SS. Temperature Limits: 20 to 120°F (-6.67 to 48.9°C). Compensated Temperature Limits: 20 to 120° (-6.67 to 48.9°C). Pressure Limit: 1.5x maximum pressure range. Thermal Effect: ±0.025% F.S./°F (0.045% F.S./°C). Power Requirements: 10 to 35 VDC (2 wire). Output Signal: 4 to 20 mA. Zero and Span Adjustments: Protected potentiometers located in auxiliary housing. Loop Resistance: 1250 ohms DC max. Current Consumption: 38 mA DC max. Process Connection: 1/4" (6.35 mm) female NPT x 1/2" (12.7 mm) male NPT. Enclosure Rating: Designed to meet NEMA 4x. Mounting Orientation: Not position sensitive. Weight: 1 lb, 10.6 oz (754 g).